We drove down to Brigantine for some Saturday morning birding. We had our hopes set on seeing a bittern since some have been reported there lately. While looking for bitterns, instead we found a Clapper Rail. Similar behavior to the Soras we have seen with the darting in and out of the reeds, but it was the longer bill than the sora that made us question what it was, and it wasn't as striped as the bitterns. 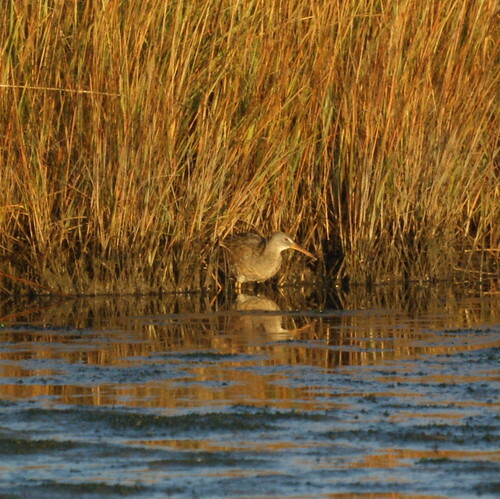 After a bit of research, we are pretty confident that it's the clapper rail. Mike was lucky enough to see the endangered California Clapper Rail on a recent trip and now we've both seen his eastern relative.